His executive orders target minorities, and his rhetoric has licensed hate crimes. That bar is America. On an ordinary night, it might host anyone who wants to buy a drink and catch the Kansas-TCU basketball game. But on another, it might turn into a crime scene because one man thinks he has the right to decide who belongs here and who doesn’t. Where did Adam Purinton get the idea that this was his country alone? And what gave him the right to tell people to get out? The answers to these questions have their roots in white supremacy. Worried that they might be swept up in a raid, immigrants have begun to avoid soccer games and church services. These promises are now being fulfilled. In January, Trump signed an executive order that banned immigrants from seven Muslim-majority countries for 90 days. The ban was rejected by the courts, but the White House plans to bring it back in modified form soon. And in February, Trump directed the Department of Homeland Security to speed up deportations, loosen the definition of the term “criminal” as it applies to immigrants, publish a list of crimes committed by undocumented people, strip them of their privacy protections, and build more prisons. Sara Beltrán Hernández, an asylum-seeker from El Salvador, was arrested at her hospital while seeking treatment for a brain tumor. ICE maintains that it is only deporting immigrants who have committed crimes, but its agents have also seized people without criminal records. That’s what happened to Manuel Mosqueda Lopez, a house painter from Los Angeles. In mid-February, agents came to his home looking for someone else, but in the process checked his papers, found he was undocumented, and put him on a bus to Mexico—until lawyers filed an appeal. No one is being made safe by these arrests. The only thing they accomplish is to deprive families of a mother or a wife, a husband or a father. They disrupt the lives of children and create generational trauma. The reaction to these deportations among Democrats has been relatively subdued. One reason is that these policies were first tested under Barack Obama, who deported more than 2.5 million people—more than all of the presidents in the 20th century combined. A significant percentage of those deported under Obama had committed only minor offenses, such as traffic violations or drug possession. Only after a huge outcry by immigration advocates did the administration change course and begin restricting its deportation orders to serious criminal offenders. During his presidential campaign, Trump promised to turn this well-oiled deportation machine on all 11 million undocumented immigrants currently living in the country. 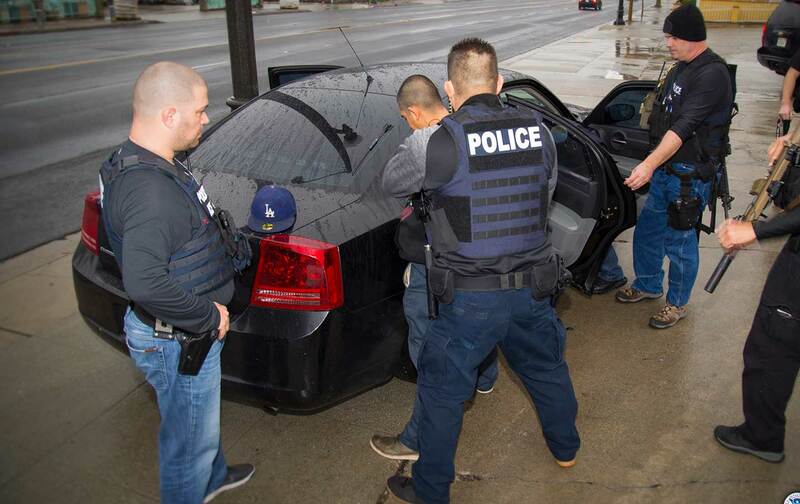 Now that he’s in office, ICE agents have conducted raids in at least 12 states, sparking widespread fear in immigrant communities. People have begun to avoid soccer games and church services, worried that they might be swept up in a raid. The Los Angeles Times reported that, after a raid on Asian restaurants in Mississippi, some undocumented immigrants stopped going to work and are pulling their children from school. Trump’s policies, and the hateful rhetoric that accompanies them, have an undeniably racist element. The president has never proposed building a wall along the Canadian border. ICE is not raiding white neighborhoods in Boston looking for undocumented Irish immigrants. This is simply an assault on those immigrants who are steering America away from a white majority. Which brings me back to that bar in Kansas. “Get out of my country” may as well be the slogan of the Trump administration, directed at anyone who is not white or Christian or straight. But this country doesn’t belong to Trump; it belongs to all of us. We must stop it from being turned into a crime scene.